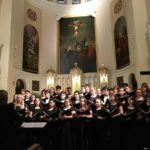 The Haverford Chambers and Concert Chorale sang a full concert at Church of the Holy Cross on 42nd Street in the heart of the theatre district. The program included “I Hide Myself” from Three Flower Songs by the acclaimed contemporary composer. Eric Whitacere; “Wade in the Water” by the modern master of spirituals, Moses Hogan; “Salmo 150” by Brazilian composer Ernani Aguiar; and “Esto Les Digo” by contemporary composer Kinley Lange. They also attended a performance of the Broadway musical, Waitress, whose cast included 2003 choral alumnus, Jeremy Morse.